Need help? How to comply with face protection legislation? Health and Safety in the workplace is paramount for both staff and visitors, so making sure there are safety signs where they are clearly visible is one of the best ways to ensure personnel stay safe. All employees and visitors to the premises must be wearing protective clothing if entering a hazardous area and face protection is particularly important. Face protection comes in several forms for a variety of workplaces; whether to protect workers from injury, shield from dust particles or to enforce good hygiene practices. By using our Face Protection Signs, it will remind staff to take appropriate measures to protect themselves and also helps to ensure compliance with all health and safety regulations. Our signs are used by a variety of industries, in hospitals, medical centres and veterinary surgeries, garages, factories and shops. Industrial applications - Having employees take measures to protect their face from hazards in industrial and chemical environments is one of the most common uses for our Face Protection Signs. Mechanics, welders and blacksmiths are particularly at risk of an injury to their face and eyes if shards or hot materials become airborne. 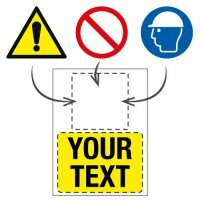 We have several signs to remind worker to wear Personal Protective Equipment (PPE) such as Face Shields, one of the most effective is our 'Stop - Face Shields Required Beyond This Point’ Signs featuring highly visible text on a bright red background with the widely-recognised ‘Stop’ symbol. Working in a dusty environment for any length of time can result in health issues later in life. As an employer, it is your responsibility to ensure your staff have the right Respiratory Protection Equipment to ensure the safety of all your employees. Simple messages such as our ‘Wear Dust Mask’ Signs can ensure that these safety concerns are not ignored. Hygiene applications - The food service industry may also benefit from some of our signs in this range. Messages such as those on our ‘Beard Snoods Must Be Worn’ Signs stand out against most surfaces, including painted brickwork and wood. They can be placed in the locker room, the staff break room and both inside and outside areas, anywhere they will be clearly seen. The medical profession as well as other environments that need to ensure everything remains as sterile as possible can also benefit from signs in this range. A great way to enforce this is to create areas where face masks must be worn by using ‘Face Masks Must Be Worn In This Area’ Floor Signs in conjunction with wall-mounted signs. Our signs are all available in a wide range of shapes and sizes that will fit in the smallest spaces as well larger signs to really get the message across. If you are short on wall space, you can opt for the hanging sign, double-sided so it can be seen from either direction. Meeting the standard - Ensuring that you offer clear warnings of the dangers present in your workplace is a legal health and safety requirement. All of our Safety Signs as well as our other safety products comply with current UK and EU laws, allowing you to find everything you need to meet legislation. Part of a wider safety policy - Informing of the risks is an important part of any health and safety program. By using Safety Signs along with the Personal Protective Equipment (PPE) that you need, such as Face Shields, Safety Goggles and Respiratory Protection Equipment you can comply with the law and give your team and safe and secure work environment..
We have a wide range of durable materials to choose from, and our range of Sign Fixings will ensure that they are set securely to any surface. If none of our pre-made signs suit your needs, you can instead opt for one of our Custom Signs. They are simple to order, with just a few steps. All you need to do is choose your design, the colour, the size of the sign and the material you need the sign made from, add your customised wording and your BS EN ISO 7010 compliant symbol and head to the checkout - an easy way to get exactly what you want.